Protect the health of your smile! Modern digital X-Rays use up to 80% less radiation than traditional, film-based X-Rays and are environmentally friendly as well. X-Rays help your dentist evaluate the health of your gums and jaw bone as well as any potential issues that may be hard to detect with the naked eye, such as impacted wisdom teeth and cavities. Every smile is unique, and our customized oral health care plans can help you take care of your smile in the best way possible. We can let you know how your oral health care routine is impacting your teeth and what you can do to improve your brushing, flossing and rinsing techniques for a long-lasting, healthy smile. The intraoral camera is a great way for you to see your smile in great detail and understand how your oral health care and your treatments at North Van Dental impact the state of your teeth. Intraoral camera photos are also ideal for insurance claims. For additional protection against cavities, we can apply a thin, clear protective layer on your teeth to seal the grooves and decrease your chances of cavities. The majority of sport injuries are dental injuries. Protect your smile, even during non-contact sports, with a custom sport mouth guard that’s designed for your smile – and your smile only. Prevention and early detection are key in the fight against oral cancer. The revolutionary VELscope oral cancer screening system is a quick, painless, non-invasive exam that highlights any lesions in your mouth that could indicate oral cancer. Book your semi-annual checkup or oral health care appointment today to keep your smile healthy and happy. Have questions? Want to schedule an appointment?Contact us Now! 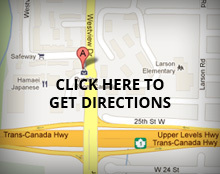 North Van Dental is conveniently located in the heart of North Vancouver at the Westview Shopping Center, just off the Westview exit on the Upper Levels Highway (Hwy #1). Free, convenient parking is available. Find us in the main plaza near Safeway and the BC Liquor Store. © 2013 Copyright North Van Dental. All rights reserved.